I've had Blue Moon (the card game) for a couple months now and have enjoyed the simple but fun dueling game and the pretty artwork. I finally got a chance to play a friend's copy of Blue Moon City last Tuesday. I had skimmed the rules a few months ago and decided it looked to complicated to play with our group. Boy, was I wrong. By Friday, we were playing my own copy. And it's good. Very good. In fact, despite being three years old, I think it still deserves a review and a much bigger audience. The game itself is quite beautiful and the aesthetics add greatly to the playing experience. Upon setup, we see a board made up of various hand-drawn tiles of buildings that need to be rebuilt. When each building tile is built, it is flipped from the architectural drawing to the actual building in all its restored glory. 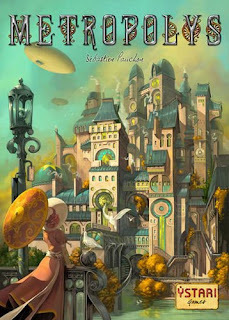 Quite pretty and very, very thematic. As well, the wooden pieces are very functional and there are nice muted choices for the different player colours. Also, the plastic dragons (same as the ones in the card game) are cute and fit very well with the theme. Finally, the cards are filled with gorgeous images from the different peoples of the Blue Moon world and are of quite good card stock. Verdict: Excellent. Very beautiful and evocative but also very functional. Not sure what bothered me about the rules when I read them online. The second time I read them on page and it took about two minutes and everything clicked. The only thing that newbies will struggle with the first couple rounds are the special powers of the different peoples. But in my games by the halfway mark it seemed like everyone was sailing along without a second thought. Verdict: Great. Easy rules, well-explained in the rules book. So what do you do? In a nutshell, the idea is to rebuild different coloured buildings in Blue Moon City by moving to the cities and playing the corresponding cards of the same colour. Finishing a building yields rewards for all the players who contribute to its reconstruction, the most important reward being crystals. With a certain number of crystals, you can make donations to the obelisk in the centre. 4 donations in a 4 player game and you win. Sounds simple but it's a Knizia game so there a bunch of twists. Most of the cards have a power on them so they can either be used for rebuilding or tossed out for their special power. Some can be any colour, some change the colour of other cards, some let you make two donations to the obelisk (for a cost), and various other things. What happens is that these cards really open up the choices and add that little bit of agony that makes this game so good. The powers do take a little getting used to but the play of them becomes intuitive after a few rounds. In addition to this, once a building is rebuilt it offers extra rewards to the players who rebuild adjacent buildings. This leads to some interesting choices for as the game progresses the rewards get bigger and bigger. This is a good thing, though, as it adds tension to the game and helps when the different spots on the obelisk become more expensive. On top of this, you have the dragons which provide their very own little subgame. One can use special cards to move them to a building you are about to help rebuild. When you contribute and a dragon is there to witness it, they give you a scale. As soon as the scales run out, they are counted and the person with most receives a whole whack of crystals. Thanks, dragons! All in all, the game plays briskly, with buildings being rebuilt, rewards being given out, dragons being moved, and donations made. Verdict: Quick and lots of fun. Somehow relaxing and suspenseful at the same time. I've played three games now with 2, 3, and 4 players and the subtleties have begun to emerge. The dragon scale competition cannot be underestimated and was a definite decider in the 2-player game. With more players, one has to decide who they will help out as everyone receives rewards on buildings they contributed to, independent of who finishes them. Finishing a building could give you lots of crystals and the first place bonus but may give another player the crystals they need to make their final donation. Tricky. The main strategies come from the cards dealt and the endless choices that they give you. Although I've read that this can cause AP, I haven't found it in any of my games (and I play with SLOW thinkers!) There is a fine balance that Knizia has struck here between giving the players lots of options and keeping the gameplay brisk. As well, every game is close, very much due to the design of when all the crystals come out, so one has to really work carefully to get that one up on the opponent. This usually means getting lotsa cubes on lotsa buildings and then having the other players finish them up for you. Verdict: Deep but not brain-burning. Brilliant. Very glad I own this and I am looking forward to many more games. It is a design that offers tons of depth but still allows a new player to, if not win, get really close to it on their first game. The theme feels natural which is rare for Knizia, and the game itself is gorgeous. My partner, a graphic designer, was drooling over the bits and said it's one of the prettiest he's seen. All of this wouldn't matter, of course, if there wasn't a solid, fun, easy-to-teach middleweight game underneath it all. But there is. 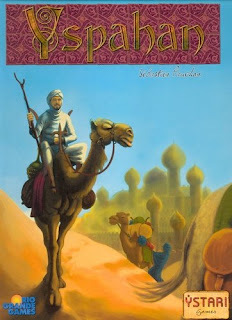 Verdict: Great strategy game that everyone should own. Played three rounds of Race For The Galaxy yesterday. Definitely still enjoy the game but it isn't pulling me in anymore like Dominion does. Perhaps it is starting to feel a little repetitive, or perhaps I've just logged over 40 rounds and have yet to understand the subtler strategies. 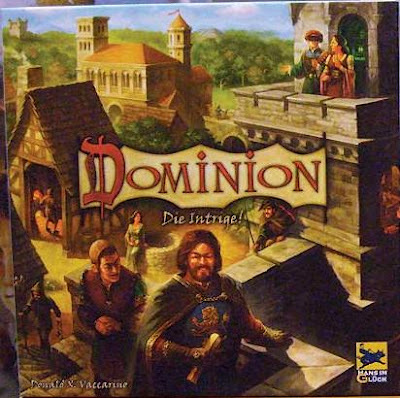 Dominion, on the other hand, has a wealth of strategies that have become quite apparent to me. Maybe it's the slow "think"-y turns of RFTG. Maybe I'm just getting impatient as I get older. So the copy finally arrived of the long awaited "greatest train game ever". I happily sold my copy of Railroad Tycoon the next day on BGG Marketplace. I will say I was nervous, having played Railroad Tycoon and been severely disappointed and unimpressed. So is the hype really worth it? The box is small but heavy and is pretty chalkful of goodies. My friends were impressed with the little plastic trains (one said, "these are way better than Ticket to Ride trains!") and the wooden bits are quite standard and reasonable. The board is a bit bland but upon playing is quite functional and actually worked fairly well. I suppose it would be nice to have everything dressed up a bit more, like say Chicago Express, but someone was lazy and this will have to suffice. Tiles are crisp and look good and the money is not an issue. Why were people so upset about the paper money? Didn't slow us down at all. My BIG complaint is not the quality of the components but the utter stupidity in colour choices. Frustratingly, the purple goods cubes are damn near the same colour as the blue goods cubes. I'm colour blind and this pisses me off. My friend, who was already unimpressed that she had to learn a complicated strategy game, said, "this company made a poor choice on colours." All I can figure is purple was already on sale and they were too damn cheap to find a more distinct colour. I hate having to ask after a goods cube appears whether it is blue or purple. Worse is two of the player's colours are made of the same colours. Poor decision. Verdict: Decent/Poor. As I had to wait a few days to play the game, I read up the rules a couple times and even tried out the solitaire version to get an understanding. 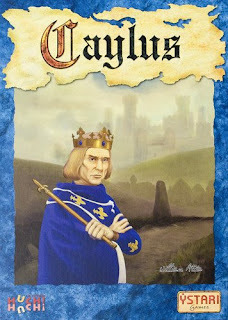 The rules themselves are complicated but logical and I think are approachable by anyone looking for good strategy game. HOWEVER, I had to go online for two different issues. One, the missing rule about the last two players out of an auction. Not a big deal as the example in the rulesbook showed it happening. The second rule, though, was completely unclear to me and I had to search it out. The issue is when goods appeared in New Cities on the board. I had to search far and wide for someone to explain that it happens when the numbered column directly above that New City is rolled. I found this entirely ambiguous in the rulesbook and was kinda unimpressed. In general, this game is complicated. I know. But that's no excuse for an incomplete ruleset. It's not that hard to have someone test it out before printing. Verdict: Decent. Onto the good part. And when I say good, I mean really good. We've only played one game so far but it was obvious immediately how great this game is. So what happens? Briefly, the goal is to earn the highest income and grow the largest set of track on the board. Income is gained by moving goods (wooden cubes) to cities of the corresponding colours on the map. For each link (track connection from city/town to city/town) moved across the owner of that link earns one income. Simple enough? No, not really. Money is tight, very tight. So immediately buying track costs money which you have borrowed and will have to pay interest on. As well, one must have an engine that is big enough to move the goods far enough. Big engine equals big maintenance costs. Of course, one can borrow more money but these diminish one's points greatly at the end of the game and make it harder to have money throughout due to the interest payments. Another important aspect is the auction for turn order, the point where the game REALLY takes off. One wants to always be first but can barely afford, at least early on, to bid in the wicked auction. The reward for first: first choice of the special powers, first track build to cut off opponents, first move of goods that your opponent may have been eyeing. All this makes for a very cutthroat and delicious game. Many more details I will leave out other than to say in each of the phases of the rounds, every decision I made was interesting, important, and hard. Gotta love it. And even the player who was hesitant to learn ended up delighting in her delivering first the good her boyfriend had been depending on. Nasty. Verdict: Excellent. Classic. Even better than everyone says. It's hard to say too much about strategy after only one four-player game but I will say money management and planning are tops. One false step can mean early bankruptcy, something we all managed to avoid in this first game we played together. It's extremely satisfying to see one's network carefully grow by a series of meaningful decisions and I am excited to explore the different strategies. Verdict: Deep. Very deep. 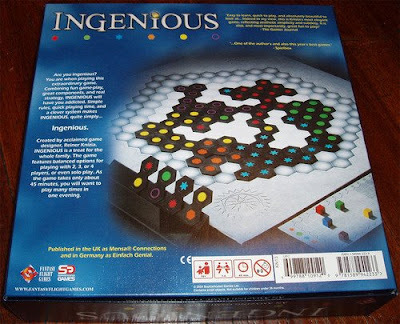 This game, despite the shoddy rules and plain board artwork, shines completely due to the monumental Wallace design. 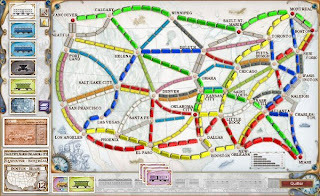 Great depth and meaningful decisions throughout and you even get to watch your network expand over the board, a reason I love Ticket to Ride. In fact, I found this far, far more satisfying than the useless Railroad Tycoon which, due to the unnecessarily large board, seemed to end right when something was actually starting to happen. I was actually surprised at how quickly we all got into it. Despite the heaviness of the game, I found it surprisingly approachable for our little game group who usually plays Dominion, Stone Age, and Acquire. Most importantly, this game is really fun, mean-spirited but fun, probably the most competitive game I've bought in awhile. Verdict: worth every penny. I know it seems like it would defeat the purpose but you can actually play many great board games online as we speak. Although it can remove the best part of cards and games - the live interaction - it still provides a nice diversion at work or a substitute for all my games that are back in BC. Sigh. 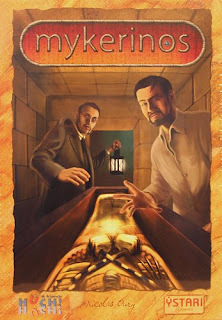 Below is a screenshot of Mykerinos, a new classic that I own and can't get enough of. It is playable on www.mabiweb.com and all the games are by email, which is quite nice. You just take your turn when the email arrives. One of the great games I own that is somewhere on the other side of the country is Tikal. The email game below that I had at www.spielbyweb.com two weeks ago made me miss it a little more. Another great site with TONS of email games is www.yucata.de. Currently playing Oregon which is convincing me that it's not worth the purchase. Last one I'll mention has tons of games live and ready to play with people around the world. Just bombed my first game of Kingsburg... sigh. Looks like a great game, though, definitely worth picking up. And the JAVA graphics on this site are REALLY good! For other places to find good weekday diversions, check out my 'Board games online' section.